Caroline was making her way back to the U.S. after vacationing in South America with some friends, when she found herself having her first acute attack. Once back in the U.S. Caroline was diagnosed with Progressive Relapsing MS. Never having had symptoms before, or rather, having symptoms unbeknownst to her, Caroline was now experiencing some of the worst symptoms caused by MS.
Caroline researched everything she could about MS and tried different forms of treatment to aid in reducing her episodes. Armed with knowledge, drive and the will to keep searching for an answer, Caroline has found a treatment that works for her. She now shares her story, advice and information about the disease on her website girlwithms.com. Through her experiences Caroline has become an award-winning blogger, a speaker and a patient expert. It was September 2nd, her sister's 30th birthday, when Sarah's life was thrown through a loop. After feeling weak, tired and light headed for months, her doctors told her she was experiencing vertigo but her parents kept pushing her to continue getting another opinion. Sarah had MS.
After doing tons of research Sarah started finding what worked best for her. Cutting out certain things like red meat or taking supplements has helped Sarah keep her symptoms down. For the past 9 years Sarah has been living her truth with MS on her own terms. Maintaining a certain level of fitness is very important for those of us with MS. Being able to partake in an active lifestyle however isn't always possible considering the varying degrees of symptoms suffered. Emily Riley was diagnosed with MS when she was 17. Being an active person her whole life pushed Emily to continue incorporating exercise into her daily routine. In 2015, Emily was given the opportunity to teach an adaptive fitness class specifically designed for people with MS. Through her fitness program Emily wants people to know that whether you have limited mobility or not, being active is beneficial not only for your body but for your mind as well. Emily shares her journey and tells us the importance of remaining active after diagnosis, click below to hear her story. At the age of 21 Dave Head was diagnosed with Ulcerative Colitis. Ulcerative Colitis is an inflammatory bowel disease that causes long lasting inflammation and sores along your large intestine. The disease caused David to have a permanent Ileostomy which meant Dave now had to live with a colostomy bag. As if dealing with one auto-immune disease at such a young age wasn't hard enough, a few short years later Dave was diagnosed with MS. Having dealt with Colitis for years already Dave fell into a routine with his symptoms. In 2010, he started developing seizures and shortly after he noticed certain symptoms became a part of his daily life as opposed to the relapsing symptoms he had grown accustomed to. Dave was then diagnosed with Pyoderma Gangrenosum, an extremely rare skin disease that causes deep ulcers on the skin which can often lead to chronic wounds or lesions. These diseases have been life-altering for Dave and no two days are alike. Inspired to help and share his story with others who may be dealing with diseases of their own, Dave started writing a blog that inspires and motivates. The response he's received since starting the blog has been overwhelming. I got the chance to talk to Dave about living his truth with two auto-immune diseases. You can hear Dave's story by clicking the link below. When Matt Embry was diagnosed with MS over 20 years ago, he and his father sought out a way to keep Matt's MS symptoms to a minimum by incorporating nutrition and fitness into his lifestyle. Being able to maintain a healthy drug-free life for over two decades has driven Matt to share his ideas with MS patients across the world through his website MS Hope. Last year Matt decided to share his journey with MS through his documentary "Living Proof". The film is a story of hope told from Matt's perspective as patient and filmmaker as well as the perspective of different people, with varying degrees of symptoms, Matt met while on his MS Hope tour. Matt tells me all about his lifestyle, the research his father has done and advocating for a drug-free way of living with MS.
MS affects 1 in every 340 Canadians, so there's a good chance you or someone you know is directly impacted by the disease. MS doesn't just change the lives of those diagnosed but also the lives of their families and friends. In 1997 when Jon Strum's wife, Jeanne, was diagnosed with secondary progressive MS her symptoms advanced so quickly that in a few short years she had become a quadriplegic. Seeing the extreme effects the disease could have firsthand, Jon started looking for ways to help other families and MS caregivers. 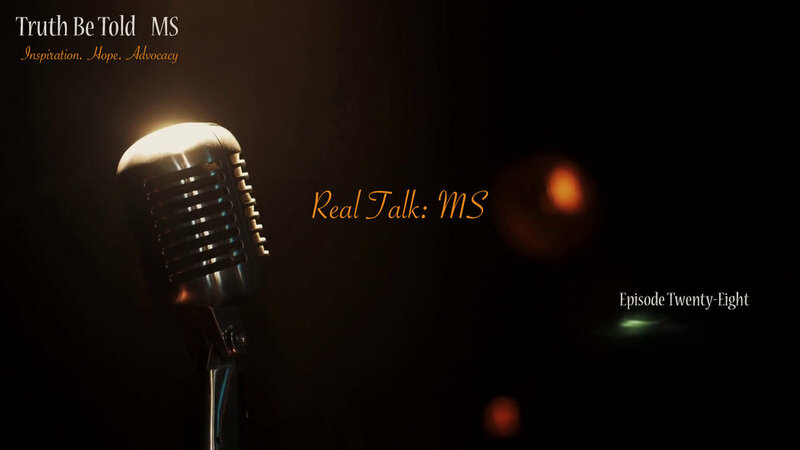 After years of advocating and researching different MS treatments, Jon started a podcast in 2017 www.realtalkms.com, a place where you can find information on current MS research, hear from neuroscientists dedicated to the cause and meet MS caregivers and activists from across the globe. You can hear all about Jon's efforts and get more information about his incredible podcast by clicking the link below. The month of May is MS month here in Canada (the U.S’ is in March), and in keeping with that I spoke to Abidah Shamji from the MS Society. Abidah is the manager of government relations for the MS Society. I got the chance to talk to Abidah about advocating for MS during this year’s elections, some amazing policies that she’s helped pass and some of the great developments we’ve made with the help of MS research. In honor of MS month, I wanted to take the time to shout out the loved ones who help raise funds for research. Ralph Cochrane has fundraised over 1 million dollars for the MS Society of Canada with his fundraising campaign MS Climbs. Ralph's mother had MS for most of Ralph's life so he grew up seeing the effects MS can have on loved ones, and from a young age Ralph was always looking for ways to help. Along with other loved ones Ralph has climbed mountains, literally, for his mother. Along one of the climbs Ralph met Bruce Elliott, who was climbing for his wife. I got the chance to speak to Bruce about his fundraiser Take A Swing at MS. Listen to the podcast below for more information about both of these fundraisers and to hear more about the climbs. When Susan Simmons was diagnosed with MS in 1995, she was so taken aback by her diagnosis that she led a sedentary life for 10 years. Fed up with being inactive, Susan realized if she didn't begin exercising she may very well end up in a wheelchair. So she began swimming, a sport she enjoyed as a child. Finding comfort in the water, Susan began swimming competitively. Through hard work and dedication, Susan swam an incredible 50 km over the span of 2 days. Click the link below to hear her truly inspiring story. 23 years ago at the age of 30 Gary began experiencing problems with his vision. After numerous eye tests that kept coming back fine, Gary's optomologist sent him to get an MRI. A few days later Gary was diagnosed with MS.
With varying degrees of symptoms Gary started on a drug treatment and incorporated exercise and healthy eating into his daily routine. Through self-discipline and a promise to his children, Gary has been able to live a full active life while living with MS. When Carlin was 19 and a sophomore in college she was diagnosed with MS. Shortly after being diagnosed, Carlin lost 2 of her closest friends. Experiencing the loss of her friends gave Carlin a new lease on life. Hard as it was to deal with school, MS and death Carlin decided to go overseas and study and enjoy her life to the fullest. She didn’t let MS hold her back even when she had no use of her left side, instead she started travelling. Carlin may not have been able to control her symptoms but what she was able to control was how she would lead her life. When Truth Be Told started, I wanted to create a space for people with MS to share their stories and to live their truth to the fullest. Imagine my surprise when I came across this amazing, funny, honest book about living with MS “Stumbling In Flats”. I laughed, I cried and I felt the author, Barbara Stensland’s truth. Single mother Barbara was 37, when she was diagnosed with MS. She went to bed one night and woke up the next morning a changed person. For two years Barbara didn’t want to accept what her body was telling her. One day she decided to embrace her MS by writing about it. This week I got to talk with Barbara about the inspiration that led to her book, funny anecdotes and different experiences she’s gone through while Living with MS.
Click the link below to hear the hilarious, witty and real Barbara Stensland, tell me all about it. Last week we let you know which travel destinations and hotels were the most accommodating for those of us living with disabilities, but what about the actual travel part? Dealing with other passengers, long walkways and air hosts that may not be so understanding can be a lot to handle before getting to enjoy some much-deserved rest and relaxation. Former journalist for the Associated Press, Ed Tobias, has travelled to a lot of different places in the world because of his work. Diagnosed with MS in the 80’s, Ed didn’t let his diagnosis stop him from continuing his work. Throughout the years Ed has passed through a ton of airports and has come to realize that getting through them is not an easy task for anyone let alone someone living with MS. Through his experiences, Ed shares tips on navigating the airport and having a stress-free travel. Read Ed’s blog at www.themswire.com for more tips and tricks about travelling, working, treating and living with MS.
Travelling when you have MS can be very overwhelming. Is the hotel accessible? Do the pools have steps? How’s the bathroom accessibility? Is it too hot?? There are tons of questions that need to be answered when you’re living with MS and looking to travel to a new country. Good thing Tarita Davenock, CEO of Travel for All takes all the guess work out for you. When Tarita was 29 she was diagnosed with MS. Unable to continue her work as a social worker, Tarita decided to focus her energies on something that she really enjoyed…travel. Tarita made it her mission to offer a travel agency to people with disabilities that helps people find beautiful travel destinations that fit all of their accessibility needs. As a writer in Hollywood for hit TV show The O.C. Cory Martin was at the peak of her career. For the majority of her twenties Cory focused on building her future and didn’t think much about dating. That was until she turned 28 and was diagnosed with MS. With a new outlook on life Cory decided to start dating right away. Cory soon found out dating with MS would prove to have its own set of challenges. Do you tell your date you have MS right away? How will they react? When’s the right time? Cory faced all these questions and more. Cory relays her journey of dating with MS in her book Love Sick and talks to Marie about dating mishaps and gives some tips and advice on dating.